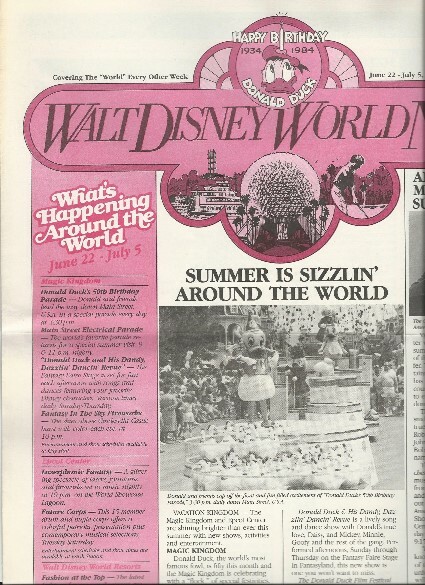 I continue my look back at 1984 with the summer park fun. 1984 was not a year where the parks were transformed into anything. It was 12th summer that the park was in operation and Walt Disney World continued to pay homage to the characters who helped make Disney Studios into the Walt Disney World Resort. 1984 was the 50th birthday for one Donald Fauntleroy Duck and the summer, at Magic Kingdom, was dedicated to celebrating his 50th birthday. 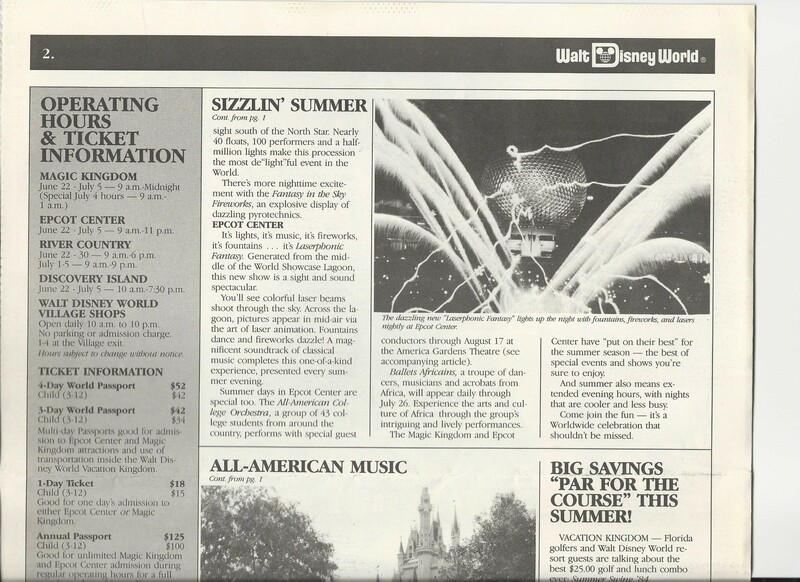 Donald, for once, got top billing on the Walt Disney World News letter for June 22 to July 5, 1984. He also got a parade just to celebrate his birthday everyday. He took over the mid-afternoon parade which was NOT held at 3 pm. It was held at 3:30 pm as Donald and his friends waddled their way down Main Street. Donald’s friends, of course, included some real life ducks. Donald, also, had a special stage show in Fantasyland….Donald Duck & His Dandy, Dazzlin’ Dancin’ Revue which took place in the afternoon on Sunday through Thursday. Lastly, guests could watch Donald Duck through the years at the The Donald Duck Film Festival in the Fantasyland Theater. The Fantasyland Theater is now the home of Mickey’s PhilharMagic. This film festival ran continuously throughout the day. Magic Kingdom returned to its regular summer parades at night-time. Night time featured the The Main Street Electrical Parade. The night time festivities closed with the Fantasy in the Sky Fireworks show. EPCOT Center was not left out of the summer fun. Not only could guests get around the World Showcase by bus. They could enjoy the All-American College Orchestra. This orchestra was made up of 43 college students who performed with special guest conductors in a daily show through the summer months at the America Gardens Theater. Also appearing in the summer were Ballets Africains who were a dancing troupe who appeared daily at, I assume, the Outpost or Morocco. The article was not clear to their performance location. EPCOT Center’s nights closed with the Laserphonic Fantasy – the precursor to Illuminations: Reflections of Earth. I’d also like to touch on the park hours and ticket costs in 1984. First off, look at the park hours. They never change (except for July 4). Magic Kingdom always open from 9 am to midnight. EPCOT Center was always open from 9 am to 11 pm. This went for both Future World and World Showcase. River Country was open from 9 am to 6 pm in June and then 9 am to 9 pm come July while Discovery Island was open from 10 am to 7:30 pm. The shops of Walt Disney World Village were open from 10 am to 10 pm. This is consistent and made it easy to plan. Tickets were very inexpensive too. You could buy a four-day World Passport (1984’s version of a park hopper) for just $52 and $42 for children (ages 3-12). That same ticket, granted a guest has access to two more parks now, costs $294 for adults and $274 for children (ages 3-9). Single-day could be purchased for $18 for adults and $15 for children (ages 3-12). An annual pass cost just $125 for adults and $100 for children (ages 3-12). That is today’s look at Walt Disney World in 1984. As always, Thanks for Reading!